I was reading an article in FiveThirtyEight a few months back which described the NBA as one of the most lopsided leagues in North America. By that it meant that the same teams tended to be successful, and you could come close to predicting which teams were likely to win a championship before the season even started. Second on that list was the MLB. When you look across the MLB it's very easy to identify a handful of power-houses who usually do well, and then half the league who is written off from the very start. Logically speaking, this seems to be a major problem because the entire league becomes more about which owner has the most money, and less about which team is actually managed and performs the best. So why is it exactly that the MLB hasn't implemented a salary cap yet? Why is that? Because a salary cap is not intended to create parity. The primary function of a salary cap is to reduce player salaries, or at least keep them from escalating too quickly. Salary caps reduce the maximum a player can earn - either directly (NBA-style) or indirectly (NFL style) by simply reducing the total amount a team may spend on salaries. The problem with MLB being uncapped (particularly pre-recent luxury tax rules) was that player contracts simply escalated as new owners came in and decided to spend a lot. That escalation was not necessarily related to total income of the league. NFL and NHL, and to a lesser extent NBA (which is a softer cap closer to MLB's current system) have direct ties between revenue and player salaries - which mean you can't have player salaries escalate dramatically, unless the total revenue for the league is very high. 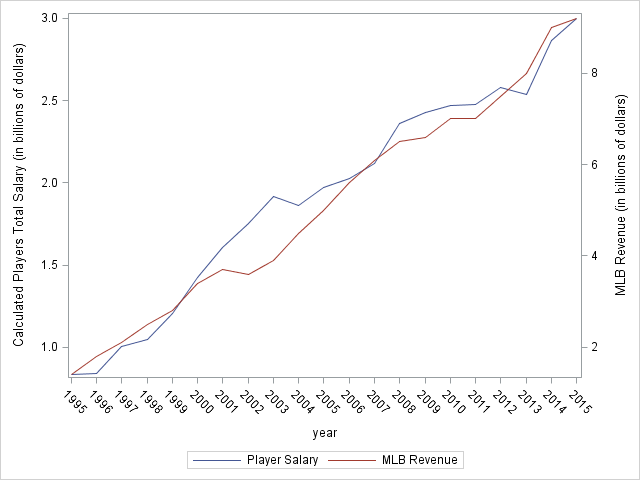 While the two lines trend together over the long term, there are some regions that are very different - particularly in 2001-2004 and 2008-2012 where player salaries were well above the trend line compared to the MLB revenue. Some of the major CBA changes were in direct result of these differences. Note that the latest CBA seems to have finally had enough impact that the players' line is below the MLB line for the first time since 1998. A full salary cap would guarantee it stayed below or on the trend line. Hence why the owners - who are almost all businessmen who want to run a successful business, Jerry Reinsdorf aside - want a full salary cap. And conversely, the MLBPA would prefer not to have one, so salaries can be higher thanks to free market bidding. One note about the NBA: Because of the NBA's very ... odd ... salary cap, it actually has less fairness. That's because Lebron-type players are badly underpaid due to the player-salary limit. NFL and NHL style salary caps are much more fair in terms of evening out competition. They also reward good front offices though - which is probably why they have fewer 'new winners' compared to the MLB. They also have less trading than the MLB of future talent for now talent, meaning that teams like the Rays, the Royals, the A's, etc. can grow on relatively small salaries by trading their good players away for future prospects who will be much cheaper. MLB also has a far more limited salary structure for newer players - most players play three full seasons for almost nothing and three more at very low rates before becoming free agents, as opposed to the NFL (rookie salaries are limited, but far less so than MLB) or NBA. Simple answer, the MLB and the MLBPA don't want a salary cap. It isn't proven that a salary cap would make things any more competitive. In terms of data, in the NBA for example, it has seemed to make things slightly less competitive. In the past 30 years, 19 different teams have won the World Series. In comparison, only 14 different teams won the NFL Super Bowl, 13 won the NHL Stanley Cup and 8 won the NBA championship in that same time frame. The only sport in that group to not have a salary cap is MLB. So it shows, at least in terms of championships, that while the big money teams do have a better chance, it doesn't always matter, and there is certainly more parity in terms of who can win it all in MLB. A team that goes over the luxury tax cap for the first time in a five-year period pays a penalty of 22.5% of the amount they were over the cap, second-time violators pay a 30% penalty, and teams that exceed the limit three or more times pay a 50% penalty from 2013 onwards. There is also an incentive to lower payroll; if in any year a team goes under the threshold, the penalty rate decreases to 17.5%, 25% or 40% (depending on prior record over the previous five years) for the next time the tax is paid, which will apply from 2013. The cap limit for 2011-2013 is $178 million, and for 2014-2016 $189 million. We find no evidence in our data to suggest that salary caps have helped competitive balance, measured as the variation in wins between the best and worst teams in a league in a given year, in professional sports. Further, there is some indication that the introduction of the salary cap in the NBA is associated with a significant decrease in competitive balance. A cap obviously makes it more competitive. The NBA without a cap would be far more easy to predict a winner. That's why the NBA must have a cap -- it's a very predictable sport. The players standing in the way of there being a salary cap is probably true. The owners of New York and LA teams would vote against a cap and everyone else would probably vote for a cap. Due to a cap reducing what a player can earn, it is voted against. It ruins the sport and is very self-centered of the players. But a player isn't generally very bright, so it's no real surprise! The reason the NBA still seems unbalanced is because you only have 5 players on the court and when 3 superstars decide to join forces, it makes them very hard to beat. That has happened lately. You can be rest assured it would be far worse without a cap. You would probably have all stars on two teams. Not the answer you're looking for? Browse other questions tagged mlb finances or ask your own question. Why are the teams in NBA's Western Conference outperforming those in the Eastern Conference?